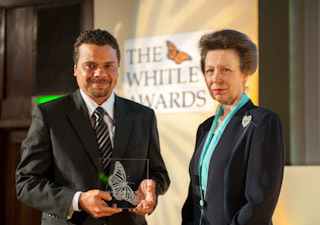 LONDON, UK: 9 MAY 2012 – HRH The Princess Royal (Princess Anne) tonight presented a Whitley Award for inspirational conservation leadership to Bernal Rodriguez Herrera, of Costa Rica, for his efforts to get four Central American countries working together to safeguard bats . Bernal, the founder and President of the Costa Rican Bat Conservation Programme, received the honour during a ceremony at the Royal Geographical Society in London, hosted by Whitley Fund for Nature (WFN) – the UK-based charity which organises the international awards scheme. His Whitley Award comprises a project grant of £30,000 – donated by The Garfield Weston Foundation – an engraved trophy, membership of the influential network of past Whitley Award winners and professional development training. The award recognises Bernal’s success at improving how bats are viewed in his home country and his drive to create a co-ordinated network of similar conservation, research, training and public education initiatives in El Salvador, Guatemala and Honduras which, with Costa Rica, support more varieties of bats than anywhere else in the world. The same ceremony also saw Dr Rodrigo Medellin of Mexico become the first-ever recipient of the newly-created Whitley Gold Award for outstanding achievement and an accompanying project grant of £30,000, donated by The Friends of the Whitley Fund for Nature. His award recognises the globally-significant contribution he has made to bat conservation since his success in WFN’s leadership grants scheme in 2004. As part of the ceremony, The Princess Royal and other guests watched a series of short films showing finalists at work. The screenings included a film about Bernal’s project, narrated by the distinguished wildlife broadcaster, Sir David Attenborough, a Trustee of WFN.